The advent of a supposedly golden period in one’s life is expected give birth to feelings of positive anticipation. This holds true though for most women. Women are said to be difficult to understand. But the same seems to be true for the guys. Have we ever pondered enough on why are guys so scared of marriage? Is it that they wish to remain their mamma’s boys? Is it plain immaturity that he doesn’t wish to start handling responsibility? While we start delving on the reasons why guys are so scared of marriage, we should also keep in mind the patriarchal set-up of most of our societies. This is where these guys have to become men and start fending for both themselves and their families. With the changes in the dynamics of families due to women becoming earning members of the families, guys have started becoming less scared of marriage. 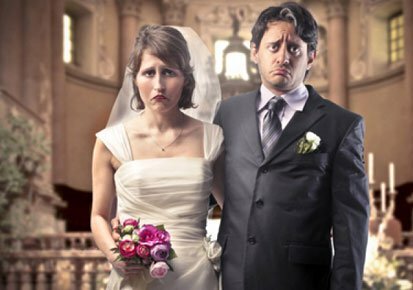 This is because of the wife sharing with him his responsibilities and making him more secure.Here are some reasons why men scared of getting married. 1.The wedding and honeymoon: His father is no longer ready to bankroll his wedding. The way weddings in India are, this is enough to give him the nightmares. He may earn enough for a living. But what about that European honeymoon his lady is expecting from him? This might just explain why guys are so afraid of getting married. 2.Bad experiences with partners: He did enter into a relationship earlier and had dreamt of a golden life with his partner. But things did not work out and resulted in a nasty break-up. Now he is plain scared of marriage. Cannot blame him though. 3.Afraid of kids: One of the reasons behind the guys being so scared of marriage lies in the frightening aspect of losing sleep over diapers! Strange but true. The women of today expect him to play an equal role in parenting. This is where he gets those hiccoughs. 4.A nasty mother: Sounds ridiculous right? You have seen how your mother treats your sister-in-law and this has led to your brother’s divorce with his wife of three years. Enough to scare you into deciding not to bring another lady into your home.